Develop self-esteem and pride when you take on the challenge of conquering the waves with your surfboard. You can learn how to ride each unique wave in our surf lessons, which are 90 minutes to 2 hours in length. 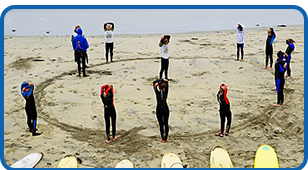 Our programs offer the most comprehensive surf instruction for beginner, Intermediate, and advanced surfers of all ages. Please be advised, all students must be able to swim. All lessons include a surfboard, safety instruction, the practice of proper surf etiquette, hands-on instruction, and a lot of fun! Wetsuit rentals are available at the local surf shops. Are you on a budget? If you don't have a group of four people, ask about joining a group. Not only will you be taking advantage of a discounted rate, you'll learn a new sport while making new friends. We also offer discounts for the family. Hold your next meeting, party, or big event on the water! We have package rates available for groups of six or more. Becoming a surfer will feed your thirst for adventure and desire to find new surfing spots outside of Half Moon Bay, California. One of the best aspects of this sport is that you can pick up your board and ride the waves on any coast around the world, enjoy the ocean, local culture, and experience the most exhilarating sport that will connect you to your environment. See the world with us, and join us for surf trips to our local California surf locations or the warmer waters of Costa Rica. Learn what it means to kick back and relax on "Tico Time" when you spend a week living the life of a surfer, touring the Costarican coast, dropping in on some of the best waves in the world, while enjoying the incredible eco systems of this beautiful country. All levels are welcome! Call for pricing and dates.